The great treasure master of our time, His Holiness Orgyen Kusum Lingpa, whose enlightened intention and activity were beyond our ability to fathom, revealed a number of practices of this deity that he received personally in his past life as the heart disciple Lalung Paldor from Guru Rinpoche, including special rituals for the deceased, and daily sadhana meditationpractices of varying lengths. 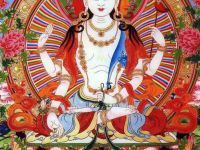 Kusum Lingpa empowered his heart disciple Tulku Sherdor to continue the transmission of this deity practice, as part of his mission to spread the Mahayana dharma as widely as possible. The practice he will offer during this program could be described as the Maha of Ati, or the Ati of Maha: meditation on the deity generated from, displayed within, and resolved back into the expanse of rigpa awareness, free of any contrivance or dualistic view. Friday evening will be the 'je nang' transmission, confering permission to perform the practice, and Saturday will consist of detailed instructions in the recitation, symbolism, view and meaning of the practice. This program is well-suited for those who seek a deeper understanding of sadhana and visualization practice in general, and the dzogchen approach to deity yoga in particular.